If we didn’t have to fit GPS loggers to three tawaki today, I would almost say that we had one of the coolest tourist experiences in Milford Sound you can ask for. First, another cruise of the fjord with the Southern Discoveries Lady Stirling. 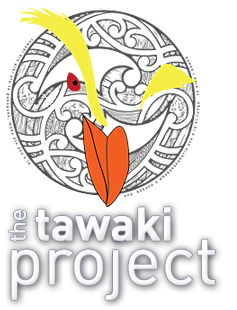 And I am pleased to report that our Tawaki fact sheet has become a permanent display on board of the Southern Discoveries boats. As the DC staff close shop at 4pm, we had arranged for our team to spend the night in Harrison Cove as we’re almost certainly will not have fitted devices to three birds before that. Most penguin only start to return to their nests in the late afternoon. So, our mode of transport to the cove today were sea kayaks which we casually paddled over to the penguin colony just before 3pm. The weather was gorgeous, the water was as crystal clear as it is advertised (just a heads up, it’s not always as clear) and the paddle pleasant. Water falls were tumbling down the sheer fjord walls in Harrison Cove and from the forests bellbird and tui calls echoed over the water. As did the commentary of one of the many cruise boats, telling its passengers that you can age tawaki by the size of their crest… and ageing method I certainly haven’t heard of before. Over the next four hours, Robin and Giselle managed to deploy the three logger packages we had prepared for the day. I just watched and enjoyed the ride and relayed the messages of arriving penguins that Hotte spotted down on the beach. It wasn’t 8pm yet when we had finished out work. Now we have four birds out with devices on, all in different colours so that Milford Sound’s cruise boat skippers can report sightings. The four of us hopped into our kayaks and paddled back over to the DC where we will camp out for the night. One more thing before I sign off… being down I the underwater observatory at night can be quite spectacular. But the sheer mass of fish around the windows when we shone our torches out was mind boggling. Add in a constant swirl of salp chains that drifted through the chaos of fish bodies and you have a perfect visualization for a very productive oceanic ecosystem. It more and more seems like a very good year for Milford Sound’s penguins. Oh, and Hotte and I will hit the road again tomorrow. Yay.